24 Hours Blogging!..... 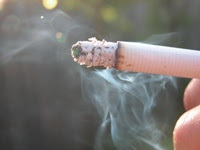 : Smoking kills nearly a million indians every year! Smoking kills nearly a million indians every year! Smoking is killing nearly a million people a year in India, exacting a higher toll than previously thought, but allied problems are often different to those seen in the West, according to research published on Thursday.A study published in the New England Journal of Medicine shows Indian smokers prefer traditional leaf-wrapped, hand-rolled "beedis" to manufactured filter brands; are more likely to die of tuberculosis than cancer; and, almost never quit. "The extreme risks from smoking that we found surprised us, as smokers in India start at a later age than those in Europe or America and smoke less," said lead author Prabhat Jha of the Toronto-based Centre for Global Health Research.The results are partly explained by the fact that, unlike in the West, many people in India are infected with asymptomatic tuberculosis. Smoking can cause enough damage to the lungs that the latent infection can no longer be contained, researchers said. As a result, tuberculosis is the most common cause of smoking-related deaths among Indian men.Around 120 million people smoke in India, most of them men, according to the study.Indian health authorities want tobacco companies to print grisly images of tobacco-related diseases on packets of cigarettes and beedis, but face opposition from politicians keen to protect the jobs of tobacco workers. Researchers arrived at their results by comparing the smoking history of 74,000 Indians who had recently died with 78,000 living Indians.